Students will explore the concepts of relations and functions in this unit, their representations, their inverses, and how to make connections between the algebraic and graphical representations of functions using transformations. Students will learn how to apply and determine the different transformations that can be applied to functions using transformational parameters, along with learning to apply function and set notations, and graphing methods consistently. Students will explore properties of functions, in particular by determining the zeros and the maximum or minimum of a quadratic function, and solve problems involving quadratic functions, including problems arising from real-world applications. By the end of the unit, students will be able to demonstrate an understanding of equivalence as it relates to simplifying polynomial, radical, and rational expressions. This unit will explore several topics including evaluating powers with rational exponents, simplifying expressions containing exponents, and describing properties of exponential functions represented in a variety of ways. The emphasis will be on modelling and problem solving using these concepts. This course includes a two and a half hour final exam and is worth 30% of your final grade. Video solutions to demonstrate mathematical form and procedure and created by Virtual High School are provided. A3 demonstrate an understanding of equivalence as it relates to simplifying polynomial, radical, and rational expressions. B3 identify and represent exponential functions, and solve problems involving exponential functions, including problems arising from real-world applications. C3 make connections between sequences, series, and financial applications, and solve problems involving compound interest and ordinary annuities. D3 identify and represent sinusoidal functions, and solve problems involving sinusoidal functions, including problems arising from real-world applications. 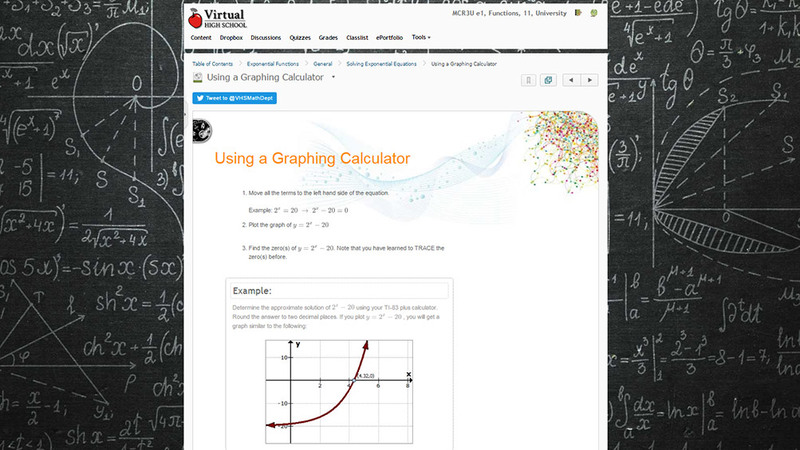 The over-riding aim of this course is to help students use the language of mathematics skillfully, confidently and flexibly, a wide variety of instructional strategies are used to provide learning opportunities to accommodate a variety of learning styles, interests, and ability levels.The following mathematical processes are used throughout the course as strategies for teaching and learning the concepts presented. Problem Solving: This course scaffolds learning by providing students with opportunities to review and activate prior knowledge (e.g. reviewing concepts related to trigonometry from prior mathematics courses), and build off of this knowledge to acquire new skills. The course guides students toward recognizing opportunities to apply knowledge they have gained to solve problems. Selecting Tools and Computational Strategies: This course models the use of spreadsheet software and a TVM solver for personal finance to familiarize students with available software and resources which will allow them to simplify calculations in order to better and more accurately manage money. Connecting: This course connects the concepts taught to real-world applications, such as simple harmonic motion and sound or light waves.